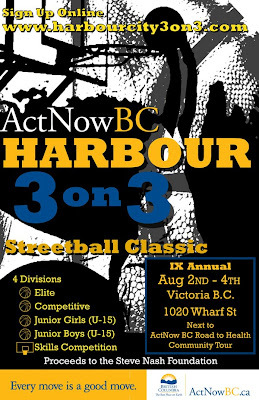 The 9th annual Harbour 3 on 3 B.Ball Tourney. August 2nd - 4th, 2008. 1020 Wharf St. Victoria. Sponsored by ActNow B.C. Round Robin: Timed 15 minute games -no possesion. Playoffs: Double knock out - no time -possesion after 3. Skills Comp is on Saturday August 2nd (4:30pm -6pm) Lay-up, 3 point, Obstacle course & The Slamadammadingdong Dunk. Sounds courtesy of DJ Rhay, Degree One, Speedy Shoes, DJ Anger, Stallion and guests.. hosted by Guy Woods and our resident tournament mc Mr. Milz 1. There's going to be a LOT of others things goin on down there, courts will be pretty tight espescially with the big crowds... meaning your going to want to watch them laces.